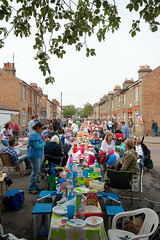 FOUR street parties so far for the Queen’s diamond jubilee celebrations in June have been approved. Swindon Council will be waiving all charges on street parties to celebrate the 60th anniversary of the Queen’s accession to the throne. Last year, there were concerns the council would be charging revellers to hold street parties on the day of the royal wedding, but this was eventually ruled out following a meeting with council officials. A council spokesman said: “We have approved four so far, one in Abbey Meads, one in Liden, one in South Marston and one in Haydon End. This year, the council has issued a guidance form detailing all the main issues involved in street parties. For more information visit www.swindon.gov.uk/ts/ts-roadshighways/Pages/ts-roadshighways-streetparties.aspx. Anyone who needs any further advice or has any concerns regarding road closures for street parties is asked to contact the Street Works Team on: 01793 466380 or email: streetworks@swindon.gov.uk.